Soma Birds Lagoon is situated at Thattekad near Kothamangalam in Ernakulam district. 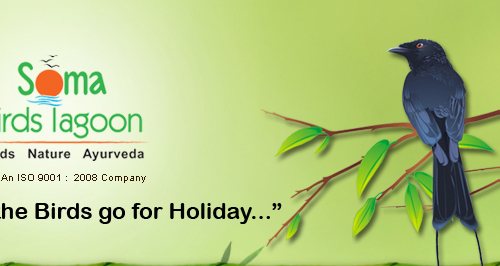 Situated on the banks of mighty Periyar river. It is about 40 kilometers away from Kochi International Airport and 48 kilometers away from Aluva Railway Station. It is 60 kms North-East of the city of Cochin. The literal meaning of �Thattekad� is plain forest. It is an evergreen low land forest situated on the banks of the Periyar river. The sanctuary has a rich and varied species of bird life. The bird sanctuary has a three storied watch tower. A few parts of the forest have been used for teak and mahogony plantation. 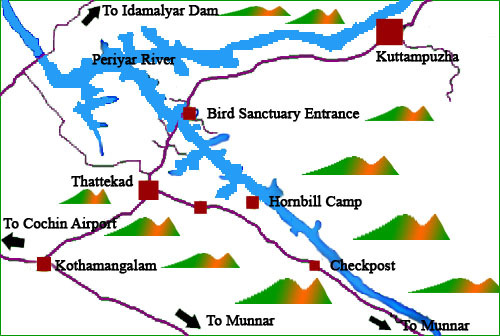 The Soma Birds Lagoon is 10 kms from Bhoothathankettu Dams built across Periyar at Edamalayar, Kothamangalam Puzha, a rivulet which meanders through the town merges with Kaliyar and Thodupuzhayar to form the Muvattupuzha river, the second largest of Ernakulam district. Soma Birds Lagoon is situated in the eastern part of the Ernakulam district and nearest town is Kothamangalam. Kothamangalam is known as the Gateway of Highrange. Geographically, it is located in the Mid-land region. The general topography is hilly. 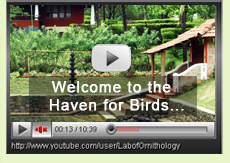 The Munnar hill station is just 85 kilometres away from the Soma Birds Lagoon.